Timber finishing is the process of protecting or refining the surface of a wooden material. Different uses of timber require different finishing and a natural division of the information is internal versus external finishes of timber. Special considerations are required when wood is exposed to the elements in applications such as decks or as part of a building envelope. Timber needs to be well detailed, carefully selected and finished appropriately to work successfully outside. 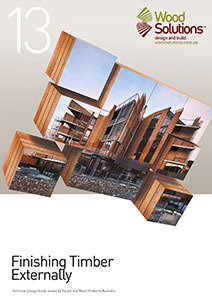 Design guide 5, Timber service life design for durability is a complementary publication that provides information on the use of bare and treated timber in many external applications. More detailed information on external timber finishes is available here. This design guide, Finishing Timber Externally, provides an overview of designing and detailing timber elements for maximum life.